I was all preachy yesterday and giving you tough love saying you should be prepared to value your business and to spend money for advice and for the proper tools. Today, bit more friendly. We’re going to talk about perfectionism. And the reason I am going to talk about this is because most of us, many of us at least, but I reckon its most of us, are quietly held back by perfectionism. Now a lot of us don’t even realize that this is what is holding us back. Perfectionism leads to procrastination, because things are never quite done. We want them just so. And they’re never quite just so. There’s always a bit more to do, therefore we never finish. So it’s never ready, it’s never launched, it’s never finished, it’s never ending. That’s not good for any of us. And let me tell you, I myself, I am a battling perfectionist. So by battling, I mean I am battling my own demons. When this really came to the forefront for me was as I’ve mentioned once or twice, or a couple hundred times, my fire safety businesses are self-managing. In other words, I’m not there. At the moment I am recording this, I am in Vancouver. That is 5000 miles away from my business. Nobody has been in touch. They are all still there. I can see it online. It happens, therefore it is managing. People, in my staff they can hire people, they can fire people. They can order stuff, they can do things without my approval. So therefore I had to let things go. And no, I am not going to sing that song. Well, unless you really ask, but you know I can’t sing because I’ve sung before. But the perfectionist within me wants everything just perfect. I mean if I went into the office, I want everybody to turn off their computer screens, at the end of the day. Now to wait until the timer lets them go off on their own. Because I’ll be thinking, will it, it’s like the fridge light you know. Is it going to happen? I want people to tidy their desks before they go. I’d love the keyboard to be in front, you know not like inch perfect but just budge it over and put it in front of the, in front of the screen. I’d like scruffy things to be put on away in the drawer. Makes it easy for the cleaner. And it looks neater. Who’s going to watch? I’d like stuff just so. And I’d like all my staff to do things the way I do stuff because it works for me. However, if that was how I wanted it, first of all nobody would want to work for me. I am sure they would gladly take their money. But they would always be thinking, well what’s the point of doing this. Jon won’t be happy anyway. He’ll always tell us how to finish it off. Or I’ll wait until Jon tells me how to do it. And I’ll be involved in everything. So I have to let it go. So, if I let the perfectionist in me come out, nothing would get done. I would not be here, 5000 miles away. Or I would be checking up when anyone wants to be paid. I’d be checking up that everything is done properly. As by the way, properly with their quotes. For those of you listening properly is what I deem as properly. But does anyone else? But here is the thing, if I stuck with that perfectionist, I’m looking at things that appeal to me, not to others. And when it comes down to it, my staff are very important, they need to be happy, they need to enjoy what they are doing, but in the end it’s the customers. We are a business. So therefore we have customers and unless our customers are happy and buying, we have no business. No need for staff, no need for me. So customers come first, and if it doesn’t affect the customer, why should it affect me? So what difference does it make whether the desks are tidy? Just to clarify, when I mention color of skin, that doesn’t matter but what I meant is, I meant the looks of people– like piercings and the tattoos and things like that. A lot of people don’t like people like that in their business. But as we don’t actually meet with customers, we are an online business, we speak to them on the phone, they don’t come to us as we don’t go out to them. Then what difference does that make to a customer? Nothing. So if my preference would be to not have someone who look like that, what’s that to do with me? Yeah, exactly. And we are equal, by the way we are lovely equal. My business is also run by women. There’s a lot of men out there who think that women can’t do stuff as well as them. Why? What’s all that about? So forget your own thoughts, forget what you’re thinking about things. That’s not how the world looks at it. And it’s not about you, it’s about them. It’s about your customers, it’s about your staff. It’s about everyone else other than you. So let those personal feelings go and on the perfectionism forgetting things just so. This could be for, oh designing, quotation in paper. Editing a photo, getting, recording a video, like this for instance. You might think, ‘Oh gosh I said the wrong thing then. Let’s start it all over again.’ No, let’s not or like all the podcast community, who would go through this afterwards listening to it and listening for when I say, like that and editing those out. What’s all that about? People will say, huh, why waste your time? So I’ve met people who have podcast shows, who record hour long shows. But they mentioned, it takes them 2-3 hours to edit the show and it’s a drag. And I’ve said why? Just don’t do that. Of course if you are a professional, if it’s the BBC, slightly different but I’m pretty sure that they don’t do that. On radio they do stuff as long as they etc., etc. Anyway that’s perfectionism, holding you back. Dan Sullivan has a fantastic book called The 80% Approach and what he realized is that he’s a perfectionist. He realized that if he could get a job 80% done, then it was good enough. Then he could, if it needed to be improved, he could hand it on to someone else. An expert. So say if it was a design of a new book cover, he could do a sketch, he could map out everything he wants it, 80%. Then give it to his professional designer to finish off. He has given them all the ideas. That person can then add their 80%, alright they do their 80% that takes it to 96%. They pass it on to editor perhaps, they add 80% that makes it to 99% I think if I am right. And, but it doesn’t even need to be that good. Good enough was great. Look at all the YouTube videos that are very amateurish, they are super successful. It’s the content, it’s not the professional video. It’s the person. In an actual fact by the way, more natural, less professional, less slick and additive videos actually perform better on YouTube. Yeah. Who’d have thought that? But that perfectionism would stop you from doing stuff. If I want to launch a product, if I wait till it’s just so, till it’s finished, till it’s perfect, everything is just right, it’s going to take me another 6 months of no money, no income. Why can’t I just launch it? And then improve it when people tell me it needs improving. Or improving once this goes along. That’s called the lean startup model. A lean business launches and then fixes, makes iterations continuously based on feedback. Quite often, what they would have fixed isn’t what the customers are interested in. quite often that product changes completely to what the customers want from feedback. Microsoft, when they launched Office a few years ago, when they launched a new edition of office or windows or whatever, they sent it out, and then we’d all wait for service level 2 or whatever it was, as an update because the first one was rubbish. It had lots of bugs, but they sent it out. Now it worked, people reported back the faults, they fixed the faults. If they waited, they obviously sent it out thinking it was good enough. If they did that extra time to wait to fix those faults, it would never have got launched. Is that happening to you? Think of your projects, think of everything you do. Just think about it. 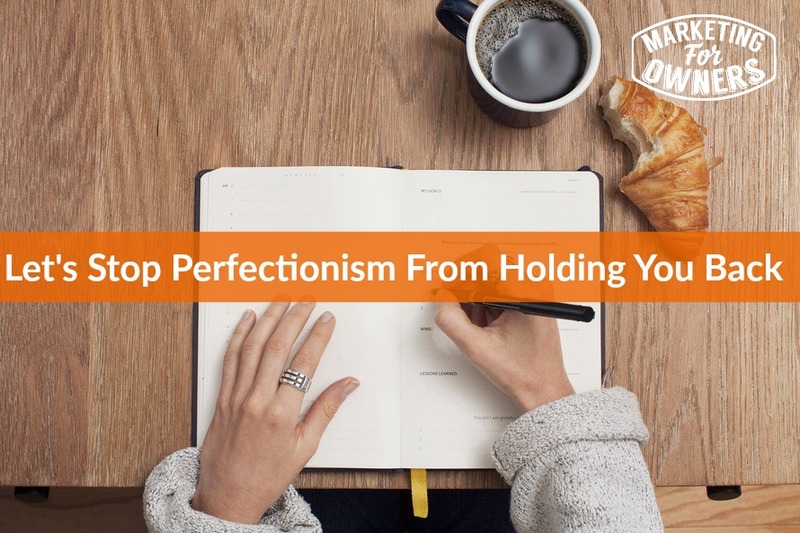 That perfectionist is holding you back. It’s good enough. In my business we now operate on, or we have now long time operate on 2 levels. We have this — Good enough for now and better. And all the time we are looking to move from good enough to now to better. Better then becomes good enough for now, and then we look for better. Good enough for now, better. Another analogy, iPhone came out, fantastic. Best thing we’d ever seen until the next iPhone. Brilliant. All those improvements until the next one, and the next one. I have currently got an iPhone 7. I thought the 1st one which is knocking around here somewhere I think, I saw it recently, still got it. I thought the first one was great. I thought it was the best thing ever. They didn’t, but they launched it. They knew what they were going to putt in the next one when they could do it, they launched it. Anyway, so that’s it. So don’t let that perfectionist hold you back. Sorry this one has gone on for long time. Tomorrow’s interview is fabulous. I am chatting with Ian Brodie and it is actually a good one. I will be back for a short tip on Thursday. Have a great day.